Do you takes naps at your office space Toronto? It seems that the staff at the Huffington Post office space have access to not one, but two nap rooms in their offices. The management of the Huffington post believes that naps can decrease drowsiness, increase alertness and benefit their staff’s overall health. The theory is that humans consolidate sleeping time for a long period at night, but it seems that we’re designed to feel tired in the early morning hours and mid-afternoon. The theory is that a two-minute to five-minute nap can perk you up and a five-minute to twenty-minute nap can improve your motor skills and performance. 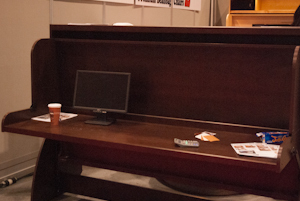 On a recent visit to the Canadian National Exhibition, this Toronto office space for rent blog writer saw the ultimate desk/bed that would be perfect for afternoon siesta. As a desk or as a bed, it takes up pretty much the same amount of space as an executive desk. Telsec’s downtown Toronto office spaces come fully furnished, but at this time they do not have desks that convert to beds. 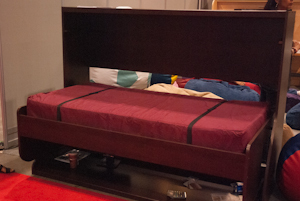 The Hidden Bed Factory has several models of their beds – some of the beds have even been featured on Opra. They now have one that looks like a corporate office space for rent cubicle, but unlike most Toronto office space cubicle’s this secretly doubles as a bed. When office for rent Toronto clients rent an office from Telsec, the office includes most office furniture, but some office space Toronto clients want their own furniture. When Toronto office space for lease clients want to bring in their own office furniture, Telsec makes arrangements to accommodate them. Even without desks that convert to beds, many entrepreneurs who have Toronto office space will admit to taking a short sleep during the day in their office chair, just to break up the everyday pressure of working for themselves. Europeans have been taking mid-day naps for hundreds of years, maybe it is time that North Americans take some time out of their day and take a little mid-day nap.